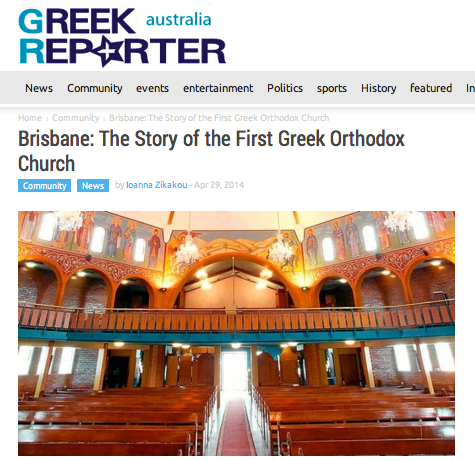 The article BRISBANE: THE STORY OF THE FIRST GREEK ORTHODOX CHURCH was published online by the GreekReporter - Australia, on April 29, 2014, authored by Ioanna Zikakou. In 1922, the Greek Community of Brisbane, purchased a property on Russell Street, the present Hellenic House. The Church sub-committee's vision was to turn this property into a Greek Orthodox Church. In 1927, with the help of the Consul General for Greece, Christy Freeleagus, the sub-committee organized a meeting in which it was decided that the church would be built on Charlotte Street. Metropolitan Christoforous Knitis, during his visit in Brisbane in 1928, ordained Elias Kotiathis from Rhodes as the new Parish Priest. During the same year, the work to erect the building of the Greek Orthodox Church began. It was decided that the Church would be built in honor of Saint George. Even thought it was small, it served the Greek Community of Brisbane for 30 years.